Your shoulder hurts and you think you may have overdone it doing yard work or exercising. But the pain doesn’t go away — it’s getting worse. The pain might be so intense that you see stars when you move your arm too quickly. You also can no longer raise your arm past your waist or wash your back. What’s going on here? All of these are symptoms of frozen shoulder syndrome, a debilitating condition that’s fairly common for people older than age 40. Unfortunately, it’s also often misdiagnosed, says physiatrist Michael Schaefer, MD. “Frozen shoulder syndrome is one of the most common diagnoses I see in my practice,” Dr. Schaefer says. Dr. Schaefer says he often sees patients who have been misdiagnosed with a pinched nerve or simple neck pain that is thought to originate in the shoulder. “It’s unfortunate, because it takes a while for these patients to get the right treatment, and the pain can become quite harsh and take longer to go away,” Dr. Schaefer says. Dr. Schaefer says people with frozen shoulder syndrome often first seek treatment with their primary care provider or go to urgent care or the emergency department for help with this elusive pain before they consult him. 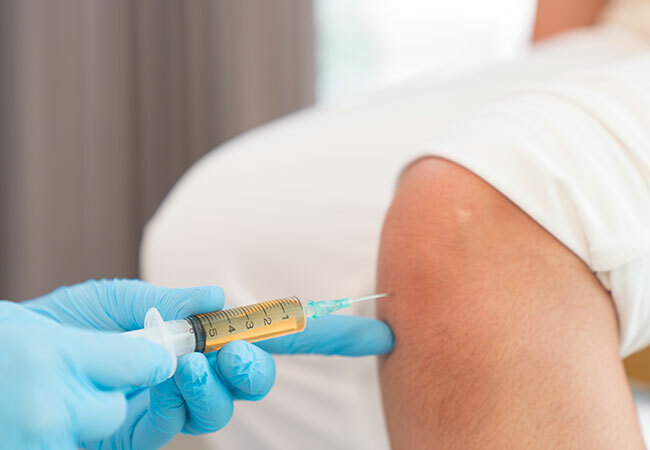 Frozen shoulder occurs when the strong connective tissue surrounding the shoulder joint becomes thick, stiff and inflamed. You stop using your shoulder because of the pain, which causes the connective tissue to thicken and tighten, making your shoulder even more difficult to move — and immobile. Causes of frozen shoulder syndrome include surgery, injury to the shoulder or other part of the body, including the head, and certain health conditions. For example, people with diabetes have a one in five chance of developing frozen shoulder during their lives because the condition is correlated with blood sugar control. People with thyroid disorders also are more prone to the condition. There also may be some element of autoimmune disease that causes frozen shoulder, Dr. Schaefer says, but it’s not known for certain. Once you have frozen shoulder on one side of your body, you are up to 30 percent more likely to experience it on the other shoulder at some point in time. Dr. Schaefer reminds his patients to see him right away if they start to feel the same shoulder pain on the opposite side of their body. Phase two, which usually lasts four months to a year, is the frozen phase when you don’t want to move your shoulder. In severe cases you might experience numbness down to your hand. To treat frozen shoulder, Dr. Schaefer recommends a cortisone injection as early as possible after diagnosis to reduce the pain. The injection should be done by a skilled physician who can use ultrasound guided injection or X-ray. Often, just one injection is all that’s necessary. But Dr. Schaefer tells his patients to return in six weeks if they are still experiencing acute pain. In addition, Dr. Schaefer prescribes physical therapy or occupational therapy, depending on the medical care available in the patient’s community. For a full recovery, he recommends going to physical therapy/occupational therapy two to three times a week for up to three months, depending on the level of pain and immobility. Most patients make a complete recovery with 100 percent pain relief over time, he says.